These are the Alaska bail bond laws as stated from the Alaska website. While the information is readily available online, note that the official version of Statutes 12.70. 150,12.70.160 and 12.70.170 should be gathered from the printed version which should be available at any city hall or government center. Unless the offense with which the prisoner is charged is shown to be an offense punishable by death under the laws of the state in which it was committed, a judge or magistrate in this state shall admit the prisoner to bail by bond or undertaking, with sufficient sureties, and in a sum the judge or magistrate considers proper, conditioned upon the prisoner’s appearance before the judge or magistrate at a time specified in the bond or undertaking and for the prisoner’s surrender, to be arrested on the warrant of the governor of this state. If the accused is not arrested under warrant of the governor by the expiration of the time specified in the warrant, bond, or undertaking, a judge or magistrate may discharge the accused or may recommit the accused for a further period of not more than 60 days, or a judge or magistrate may again take bail for the appearance and surrender of the accused, as provided in AS 12.70.150, but within a period of not more than 60 days after the date of the new bond or undertaking. 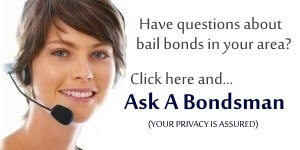 If the prisoner is admitted to bail and fails to appear and surrender according to the conditions of the bond or undertaking, the judge or magistrate, by proper order, shall declare the bond or undertaking forfeited, and order the immediate arrest of the prisoner if the prisoner is within this state. Recovery may be had on the bond or undertaking in the name of the state as in the case of other bonds or undertakings given by the accused in criminal proceedings within this state. NOTICE: This Alaska Bail bonds laws are an unofficial version of the Alaska Statutes and may contain errors or omissions. The information is provided as a convenience to the public. We make no warranty, express or implied, of the accuracy of the information presented here. Use of the information is the sole responsibility of the user. Look to the official version of the Alaska Statutes by referring to the printed version.